If you’re looking to unlock new design potential in automotive applications – boosting performance, cutting fuel emissions and reducing cost of ownership - then ForTii PA4T metal replacement (MX) portfolio is your number one choice. The ForTii MX portfolio contains semiaromatic polyamides, based on DSM’s PA4T technology, enabling you to engineer the incredible, by thinking beyond metal and beyond its traditional alternatives. ForTii is tested extensively in parts, since testing of tensile bars does often not represent the part complexity (ribs, weldines, inserts) in the real world. Modern engine downsizing trends put high demands on automotive systems and its components. 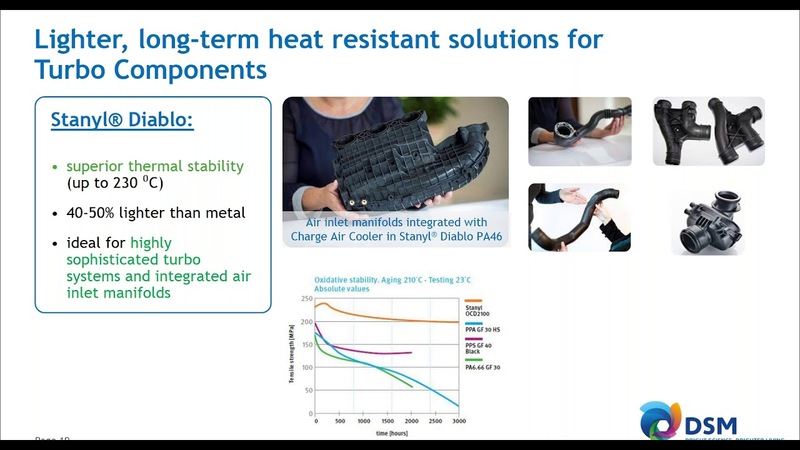 DSM’s semi-aromatic polyamide ForTii MX15HR is the perfect solution for automotive cooling components such as thermostat housings, valves and hose barbs. ForTii® Ace MX53T enables designers to realize up to 50wt% reduction versus alu die-cast replacement, NVH optimization (damping, stiffness), cost reduction in case of multiple secondary operations (10-30%), or part integration to de-complex the production chain (less steps). What is a PPA (or Polyphthalamide)? Do you know what a PPA (Polyphthalamide) is? 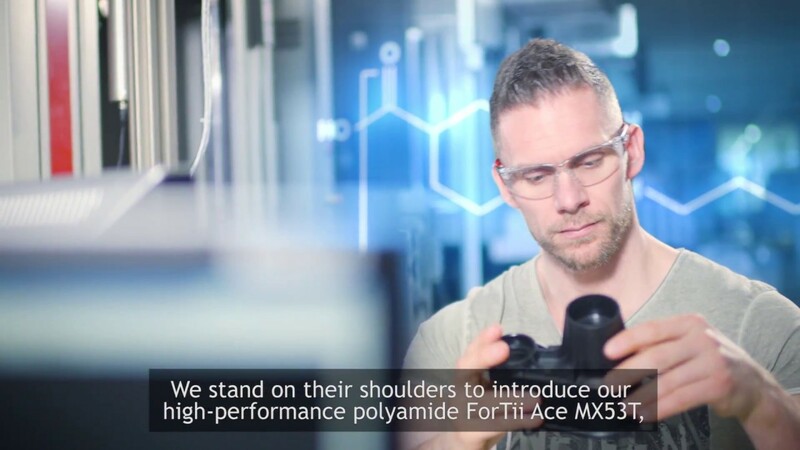 In this 5-minute explanatory video, learn the basics about this high temperature polyamide that can be used in various demanding applications. 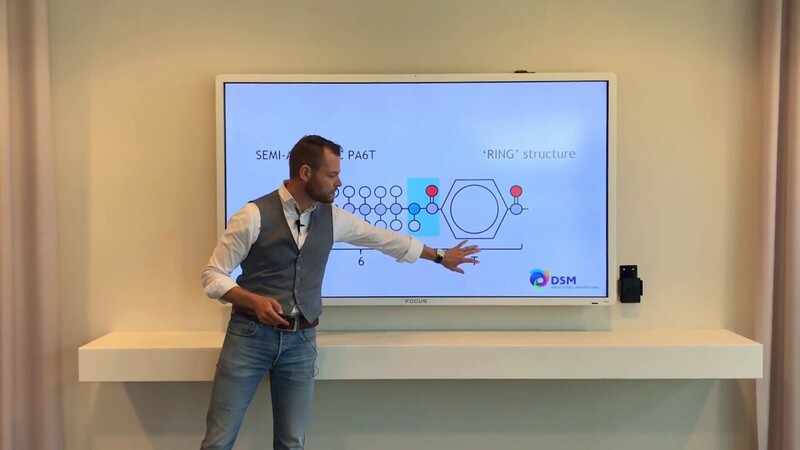 Watch this 30-minute webinar, hosted by Bert Havenith, Strategic and Market Intelligence Director at DSM Engineering Plastics, to learn about the latest trends in automotive lightweighting and metal-to-plastic conversion. In this video, learn everything about the stable mass production of parts with ForTii Ace MX53T, PPA GF50%. With PA66 in short supply globally, manufacturers are seeking out alternative materials for their part production. Learn more about whether PPA is a suitable and cost-effective alternative material for your application. As the automotive industry races to keep up with the needs of autonomous vehicles, ride sharing and electric propulsion, OEMs and tier partners need engineering tools that can help them cut development time without compromising on quality or safety. 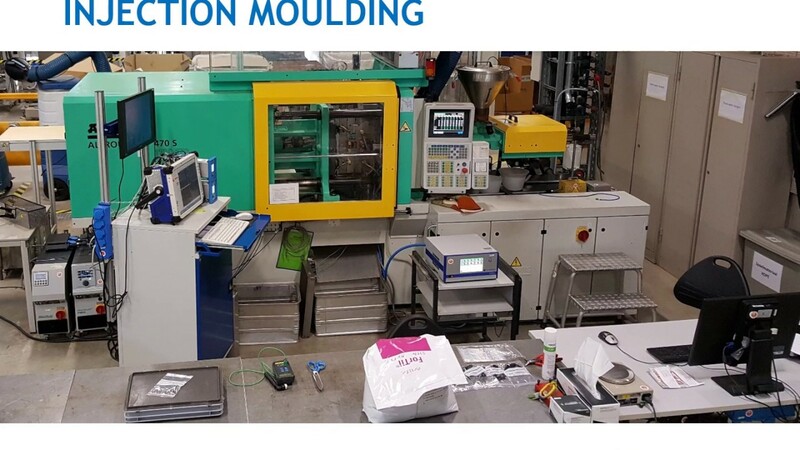 They simply cannot keep up with the rapid change of pace without simulation and virtual prototyping tools. The heat a motor and its systems produce must also be dissipated. But the specific requirements have become much more complex. Datasheets, product specs & properties, test results, diagrams, ISO certificates, OEM specs, yellow cards and more. 30-50% Glass Reinforced, High performance, general purpose. 35% Glass Reinforced, Hydrolysis resistance (HR), thermal management, water/glycol resistance. 15-20% Glass Reinforced, High stiffness/density ratio, excellent chemical resistance, incl. coolants and transmission oil. 30% Glass Reinforced, Excellent stiffness at 100-150°C and chemical resistance. 50% Glass Reinforced, Part performance from -35°C up to 150°C. Enhanced surface quality for sliding and sealing functionality.